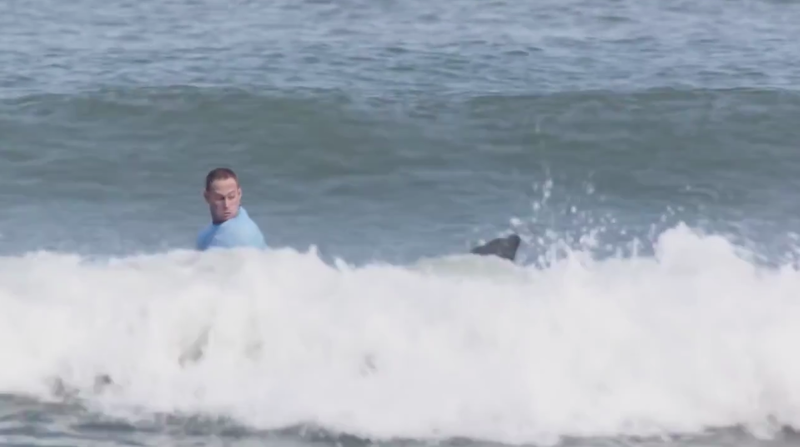 It was the shark attack caught on a live surfing broadcast, and then seen around the world. But Mick Fanning's family is condemning a comical new KFC ad that revisits the Australian's recent brush with death—saying it's no laughing matter. The spot was made for the South African market, where Fanning was competing when he was attacked in July. Luckily, he survived with no major injuries, but his mental trauma was apparent in the days following. Now, KFC South Africa tries to have some fun with the whole incident in a ludicrous spot that re-enacts the attack—though with a ridiculously comical outcome designed to appeal to young viewers. But Fanning's mother, Elizabeth Osborne, told Fairfax Media this week that the ad was shameful and that the World Surf League could take legal action against KFC. "I think it is very disrespectful," she said. "They've put a look-alike in the video. It really brings back a lot of trauma for everybody who has been attacked by a shark. Some families have had fatalities, and some people are still absolutely scarred without limbs. It's disrespectful to them, and Mick is not at all happy with that." Check out video of the Fanning attack below.